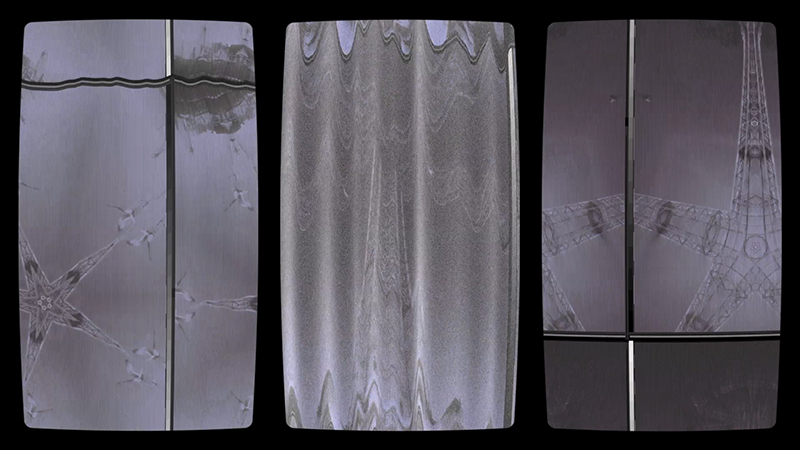 Artist Leslie Thornton describes the digital as the “repository of everything.” In “Luna” (2013), her new and seductive three-channel video work on view at Winkleman Gallery in New York, her ambition is to construct a visual history that begins in 1900 and ends in the near future — say 2020. “Luna” foregrounds the use of digital effects to recreate the visual and aural sensation of various time periods, using the same set of three images as “actors” reappearing from scene to scene in different period costumes, to different musical scores. Thornton, based between New York and Rhode Island, has chosen Coney Island as her setting. It’s a perfect choice given its carnivalesque history: a place of play, entertainment, amusement and marginal subcultures. Her camera is focused on its greatest icon: the Parachute Jump. Included in the National Registry of Historic Places, the 250-foot-tall amusement ride was originally installed for the 1939 World’s Fair in New York and moved to its current location in 1941. It ceased operations coincidentally at around the time of the second New York World’s Fair in 1964. 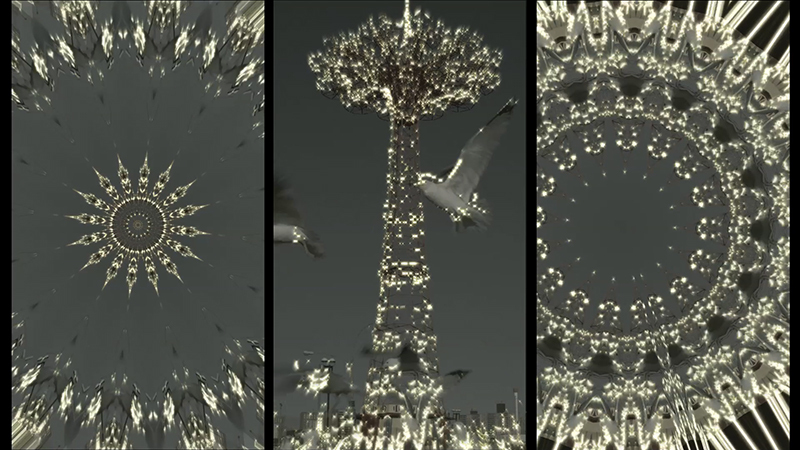 This fantasy icon lends itself graciously to digital manipulations of time. 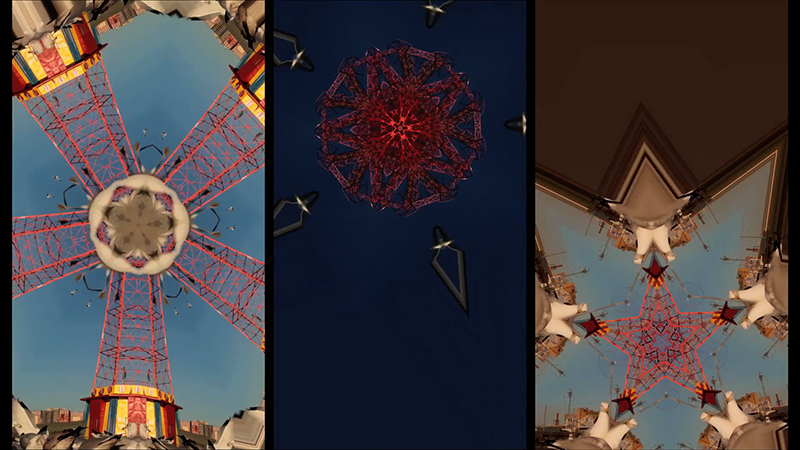 A digital triptych, “Luna” shows us three simultaneous views of the Parachute Jump. As the videos unfold we begin to see how historically freighted certain visual and aural cues are, and how they contribute to our recognition of a particular historical period. One moment we can see and feel the turn of the century and in another we perceive Weimar Germany. Thornton elegantly coaxes us along, focusing our attention on the subtle shifts that suggest a change from one period of time to another, and an attuned consciousness to how things looked and sounded. After all, do we really know how Enrico Caruso sounded or do we merely recognize what recordings of his voice made in 1920 sound like? “Luna” is mounted on a wooden scaffold and we face its three screens as if looking upon an altar piece in a darkened cathedral. 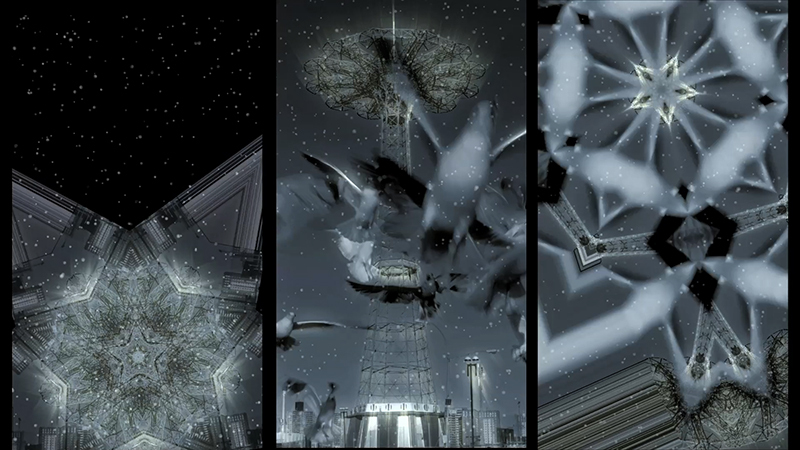 The footage on the right and left is the same as the footage in the central panel but it has been digitally manipulated in a different way. Still, we recognize its sameness because movement in the central panel is simultaneously echoed in the other two. A bird may rise off the ground and to the left a kaleidoscope of white and grey will flicker; it’s almost as if life is being reduced to its primary building blocks or to a set of fractals as we watch. Thornton, who was awarded a Guggenheim Fellowship this year, has long had a precocious understanding of how technological means (or forms) integrate themselves into content, defining, limiting, and determining meaning. As such, “Luna” is a tour de force of that understanding. Most of us are somewhat conscious of the way in which the technological tools both create and limit what is possible visually. For example, a tool like Photoshop created an entire genre of images, some of which depended on ideas that preceded the technology such as refining certain forms of collage, while others explored new attributes of the program. But images made in Photoshop are limited by what Photoshop can and can’t do, and these limits become a part of the content of those works even when we are not completely conscious of them. It is easier to recognize this phenomenon in hindsight — it’s what we mean when we say something looks “dated.” And by that we may not mean “no longer relevant” but rather, tied to a particular time or technology in the way that, for example, William Eggleston’s prints are so profoundly tied to the dye transfer process and the specific colors that this available technology rendered. On view alongside “Luna” is a work from Thornton’s Binocular Series. 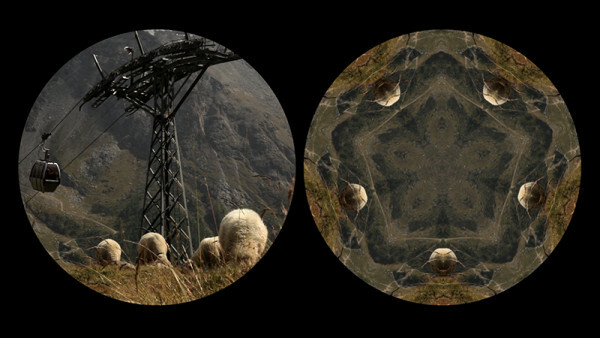 “Sheep Machine” (2011) consists of two circular video images; one is fairly straightforward documentary footage and the other is a digitally manipulated and pulsing kaleidoscope. Filmed in the Swiss Alps, it shows a flock of sheep grazing next to the structural support of the cable cars going up the mountain. Notably, that structure is oddly reminiscent of the architectural scaffolding of the Parachute Jump; the former in black and the latter in red. And while these works function in different ways, they both ask us to pay close attention to how we see, how vision constructs our reality, and how the representation of vision is a part of that construction. Thornton is perhaps best known for Peggy and Fred in Hell (1985-2010), a series that originated on film and eventually migrates, at least in part, to video. It presents the lives of two children who go about whatever it is that they do isolated from all others and seemingly raised by a television set. We are familiar with the sensational stories, later often proven fraudulent, of feral children. The Roman twins Romulus and Remus were purportedly raised by wolves, and in keeping with the zeitgeist of late ‘60’s and early ‘70’s “return to nature” values, both François Truffaut’s L’enfant Sauvage (1970) and Werner Herzog’s The Enigma of Kasper Hauser (1974) examine the phenomenon of the “wild child.” But what kind of a “wild child” emerges from the TV den instead of the wolf den? There is an arc of examinations ranging from popular culture, in films such as Videodrome (1983), intellectual writings such as those of Raymond Williams, novels such as David Foster Wallace’s Infinite Jest, and much in between. We hear about children raised on television but what if this were literally so? What if that form of diffuse and artificial intelligence raised two small children? Peggy and Fred in Hell is a possible outcome. They’re two modern feral children whose world was constructed solely by the television set — a glowing cathode ray that focuses all of their attention and provides their entire understanding of the world. We aren’t watching Peggy and Fred watching television so much as we are watching them be television — acting out their world as if they were on screen. So they mirror their understanding of a TV world to us watching them on a TV screen; an endlessly receding recursive relay. 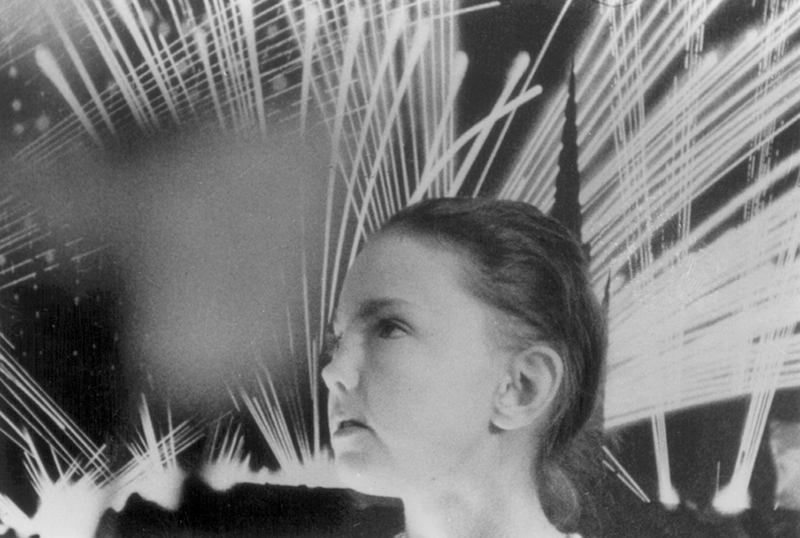 Because this earlier work considers the stupefaction of television, its relationship to visual pleasure is a conflicted one, whereas in Thornton’s more recent works, like her Binocular Series and “Luna,” uncontested beauty is given free reign. If we are seduced into watching for long stretches we won’t be taken over by evil miscreants (Videodrome) or unable to leave the set until we die of starvation (Infinite Jest). But if we are thoughtful, “Luna” will provide us with a glimpse at the power of digital tools to remake our known universe and point out signposts we’ve passed along the way that form our consciousness of time far more surely than a ticking clock. Leslie Thornton: Luna is on view at Winkleman Gallery (621 West 27th Street, Chelsea, Manhattan) through June 22.